For this installment of Sugar High Friday (yes, I know it's technically Saturday, but Blogger wouldn't work with me last night. ), Nicky from Delicious Days asks "Can you can?" And I'll answer with a resounding YES! I can can - and I can bottle, too! 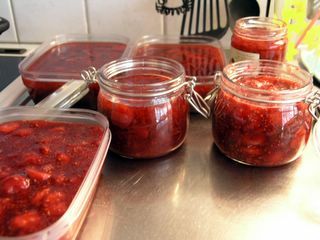 I don't usually do so very much jams or preserves, mostly because as much as I love to make them, they tend to be forgotten quickly. I don't really eat much jams and thus my fridge fills upp too fast. But, regardless, I had to make something with all the lovely strawberries that were available this summer! I won't give you exact recipes - I used Swedish jamming sugars and stuff like that, and it's probably easier to follow your own products recommendations in that regard, but I'll give you some general ideas. 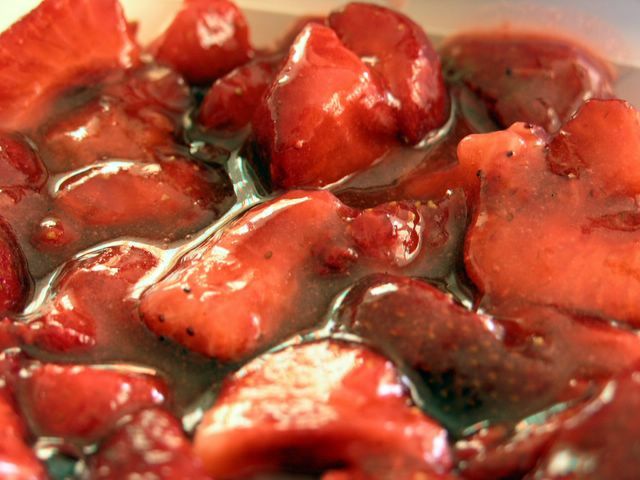 I made straight-up strawberry freezer jam. It's an old recipe from one of my friends from university, Cissi. The magic in this is that it's no-cook - just cut up the berries, sprinkle over sugar and Certo (a magic powder that you can use for exactly this, I have no idea what's in it and it was hard to find, too!) and a wee bit of water. Stir - and that's it. It tastes just like fresh strawberries, all year round. Third one was a delicious mix of strawberries and raspberries! I used 600 g strawberries, 400 g raspberries, and jamming sugar. Couldn't be easier. Here, you can also see my labels that I've made. 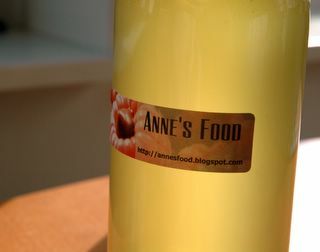 I use them for all kinds of foodrelated goodies - and I love them. Start by peeling the lemons carefully, making sure that you only get the yellow part and no white. Put it in a bowl, and cover with the vodka. Cover with plastic wrap or a towel, and let stand at room temperature for five days. Stir once in a while. After five days, remove the lemon peel. Bring water and sugar to a boil, and let it cook for ten minutes to make syrup. Cool completely. Combine sugar syrup with the alcohol, and filter through an ordinary coffee filter into clean bottles. Let stand to develop flavor for a month, then serve really, really cold. Hej, det var kul att träffas! Hoppas att det blir fler gånger! Har tittat runt lite och hittat mycket som ser gott ut och jag kommer säkert att testa fler recept! Enkla grundrecept för bär är alltid bra att ha, fast i år har jag varken syltat eller fryst in. also you should really check out tenstamarknad (www.tenstamarknad.com) this weekend, lots of good food! Strawberry-rhubarb is my favorite.. I sure hope you have a big freezer for all that jam! Hi Anne, I love your website because you have such clever ideas. I had never thought about making limoncello before. Where did you get the recipe? I love your labels--how cute! And with that gorgeous raspberry image as well. Lovely.